"The classic MacOS browser in its Windows version." 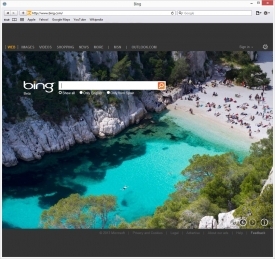 Apple has decided to bring this version of Safari browser to Windows operating system. Among its features we can find tabs browsing, pop-up blocking, anti-spam filters, etc. It keeps the essence and the design of Mac OsX Safari and is now available for those who want to use it on Microsoft. The new improved search system results in faster search results, web recognition and automatic search fill and predictive spelling, Facebook integration which lets sharing a web page with our friends directly via social network or through email. Apart from HTML5 support, the latest Safari versions also have an option of choosing search provider, the possibility of adding extensions for giving more functionalities to our search. Moreover, as other browsers like Opera, the new Safari shows mostly visited or recent web pages’ miniatures spread on the main page. We can also recover the webs that we had been reading in case of accidental computer shutdown or some Windows or Safari problems. Apart from this all, according to Apple, this browser loads the pages up to 1.5 times faster than Firefox browser and other alternatives. Without exaggerating this much, it is true that the fluency and the speed of Safari loading is really well, including various display modes like private browsing where no search registry is saved, which is very nice when it comes to using public computers or other people’s accounts.